Showing 56 articles from November 6, 2013. An incumbent went down in Franklinton, three new faces join leadership in Youngsville and a fresh face joins two stalwarts in Louisburg following Tuesday’s election. Results will become official with a canvass on Nov. 12. In Franklinton, incumbents Art Wright and John Allers retained their seats, but Commissioner Al Barbour was bested by political newcomer Johnny Wayne Mitchell, who garnered 147 votes to 137 by Barbour. FRANKLIN COUNTY — An incumbent went down in Franklinton, three new faces join leadership in Youngsville and a fresh face joins two stalwarts in Louisburg following Tuesday night’s election. Old records too far gone? LOUISBURG — An effort to preserve old documents kept in the courthouse basement has been thwarted by the ravages of time and neglect. The Heritage Society of Franklin County proposed relocating historic documents that had been resting for decades in the dark, damp courthouse basement. SNIP OF THE RIBBON. Miracle League Executive Director Donna Wade, center, is joined by Novozymes’ Laura Perry, County Commission Chair Shane Mitchell, Assistant Superintendent Tommy Piper, Robbie Oakes and Cheryl Keith. 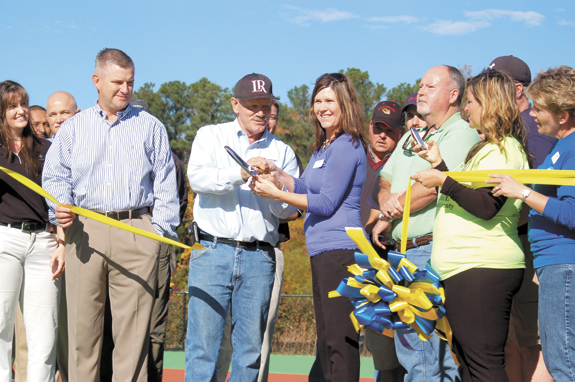 The ribbon cutting marked the official opening of phase 1 of the Miracle League field that’s especially designed to allow children with special challenges to play ball and enjoy the outdoors. LOUISBURG — The county has received a grant that will place school resource officers at each of its elementary schools. Save for one deputy who will split time between Franklinton and Youngsville elementary schools, those SROs began duty on Monday. “We’re excited to have SROs at our elementary schools,” said Assistant Superintendent Doug Moore. LOUISBURG — It goes without saying that farming is a conservation business. You want to use as little as possible and reap the best yields. 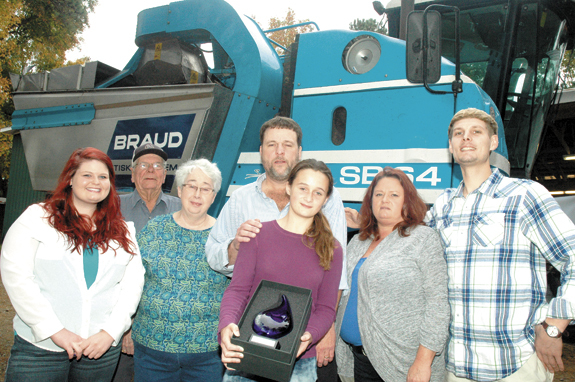 So, in order to earn the county’s Conservation Farm Family of the Year Award, the Fosters had to go a step beyond. Their Pete Smith Road farm, which features a solar pump station and 40 acres serviced by an irrigation/fertigation system does just that. It seems that almost everyone has an opinion about the Franklin County School System and school officials want to hear all of them. With that in mind, they are working on a strategic plan that begins with a survey of both school employees as well as members of the community. Is there a warning in teacher turnover rates? Almost lost in a very routine Franklin County Board of Education meeting Monday night was a brief, sketchy report that could prove to be a harbinger of bad things to come. Or, it could be one of those statistical aberrations that happen occasionally, but aren’t a sign of a long-term trend. The information came in the form of a report to the school board by Dr. Cheryl Benson, assistant superintendent for human relations for the school system. The “they” were the county’s Board of Education and the county commissioners. And, frankly, talking may have been a bit of a stretch but they were in the same room at the same time hearing the same information. County staff and leaders were taken to task this summer after it was revealed that its Economic Development Commission didn’t meet much. In fact, the group — charged with coordinating the efforts to grow existing businesses and lure new ones to the area — did not meet the first of this year. And they didn’t meet in March or April. There are two major projects that can help Franklin County achieve its economic potential, one of which is the widening of 401 into Louisburg. Regardless of what direction(s) Franklin County takes, it will, in part, always be a bedroom community of the Raleigh metropolitan area. It is not the content that matters. 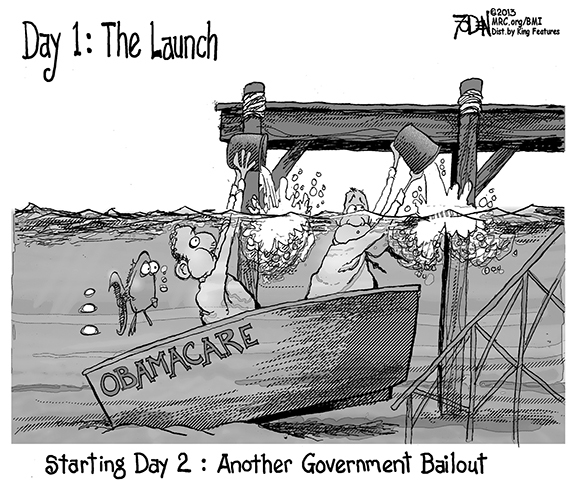 It is all about the distractions. Approaching what I write in this column from a balanced view is always my intent. While I do generally come from a place commonly referred to as the “right,” I do not hold that any political party group, or person is always right. Those that do, start off not being so. Domestic or not, violence is violence! Another victim of domestic violence was killed recently in Franklin County. Although there had been numerous calls to the home for domestic disputes, unfortunately this time it escalated to a husband allegedly being murdered. Safe Space Inc. is known throughout Franklin County and the state as one of the outstanding domestic violence and sexual assault agencies. You know what, Doug Berger is right on one point. Myself and my fellow patriots all across our great nation are totally against democracy! That’s because the United States of America is a republic! You would think that a former NC Senator would actually understand what his oath meant when he swore to uphold and defend the NC and US Constitution. Guess not! CLAYTON - Mrs. Chanda Sutton Garrett, age 38, of Clayton, NC, passed away on October 30, 2013 in Raleigh. LOUISBURG—Linwood Denton Champion, 87, died Monday morning, Nov. 4, 2013. A funeral service was held Wednesday in the chapel of Strickland Funeral Home. Burial followed in the Champion-Gupton family cemetery at White Level Community Holiness Church. 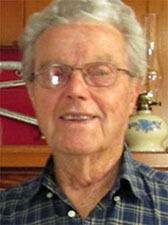 DURHAM - Marshall Lee “Jack” Horton, 82, died Wednesday morning, Nov. 6, at his home. Funeral services will be held Friday, Nov. 8, at 2 p.m. in the Howerton & Bryan Funeral Chapel, with the Rev. Jim Turnbough officiating. Burial will be in Oak Grove Memorial Gardens. IT’S A BALL BATTLE. 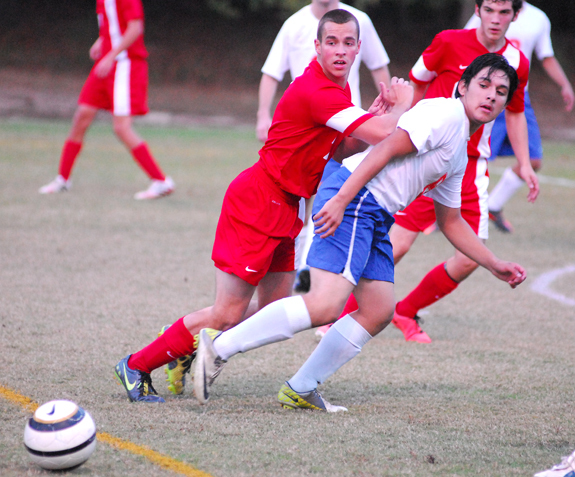 Louisburg High School’s Kaleb Calamaco (right) duels for possession with a Voyager Academy player during last Wednesday evening’s first-round contest of the Class 1-A Boys Soccer State Playoffs at Joyner Park. 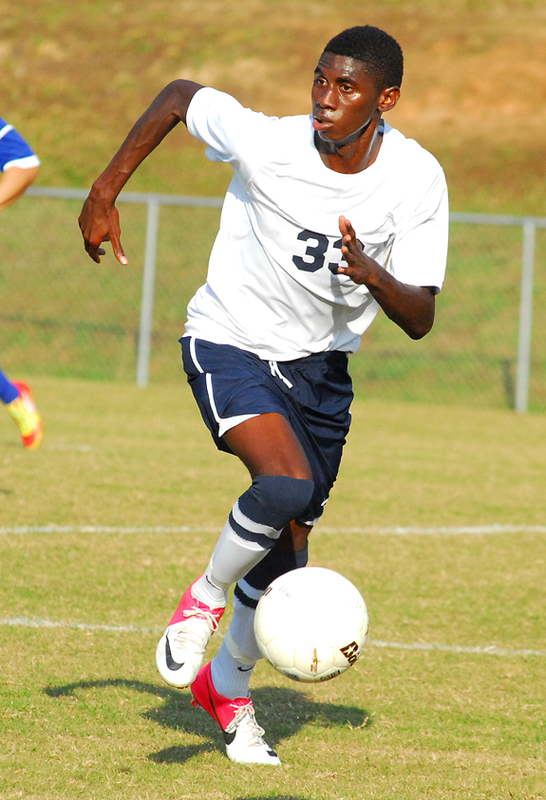 LOUISBURG -- Only one Franklin County school was able to survive the first round of boys soccer postseason -- the Louisburg Warriors. Louisburg, coached by Chris Cannady, took advantage of a home match by taking Durham Voyager Academy on Wednesday in the opening round of the Class 1-A State Playoffs at Joyner Park. I SEE YOU. 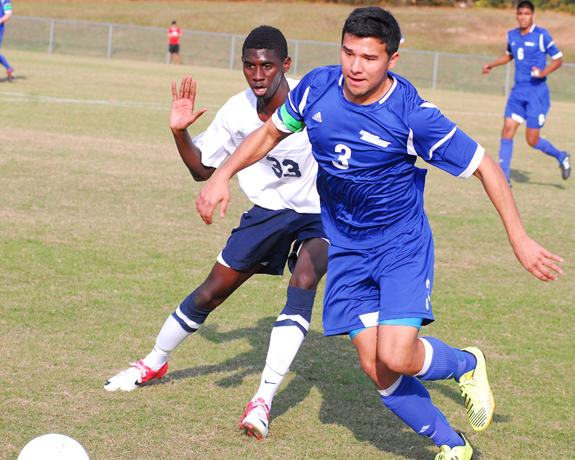 Louisburg College’s Ostin Salmeron eyes an open teammate during last Tuesday’s first-round game with the University of South Carolina-Lancaster in the Region X Men’s Soccer Tournament at May Field. 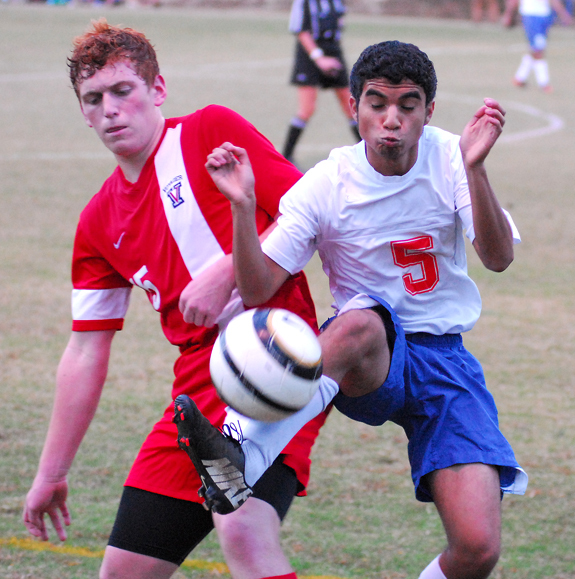 LOUISBURG -- Through the years, it’s almost a given that the Louisburg College Hurricanes will enter the Region X Men’s Soccer Tournament as the No. 1 seed. But this time around, LC is the second seed -- albeit with a huge asterisk next to its name. The Hurricanes didn’t lose a region match during the regular season, and only had one tie as the result of an equalizer against Cape Fear Community College. THE TITLE DEFENSE BEGINS FOR LC. Courtney Raiford of the Louisburg College Lady Hurricanes (left) drives to the basket during LC’s season-opening victory last Friday against Frederick Community College at Taylor Center. LC is the defending national champion, but Raiford is one of the few key returnees for new coach Shay Hayes. ONE MORE YEAR FOR BHS. Standout guard Deshaun High will return for his senior campaign for the Wildcats. BUNN -- The Bunn Wildcats will kick off their 2013-14 basketball schedule on Dec. 3 with a road contest against East Wake. GREENSBORO -- North Carolina A&T freshman running back Tarik Cohen (5-8, 170, Bunn, N.C.) was added to the Jerry Rice Watch List last Thursday. The Rice Award, now in its third season, honors the top first-year player in the Football Championship Subdivision. Only redshirt freshmen and freshmen are eligible. FRIENDS, TEAMMATES AND FOES. 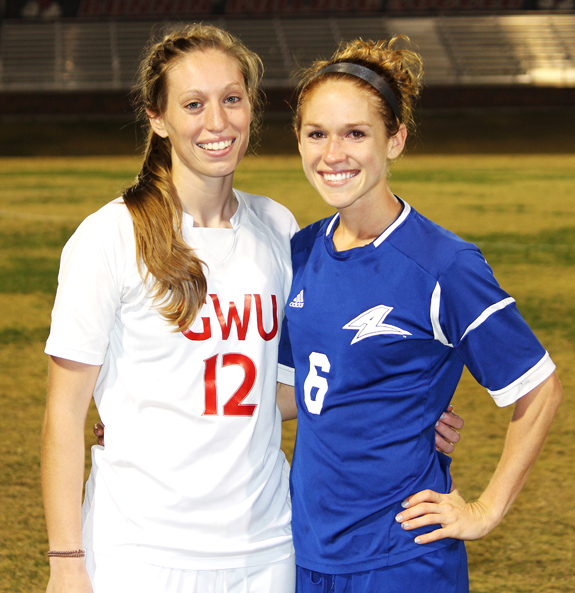 Long-time friends and former Franklinton High School teammates (l to r) Shaylyn Poppe and Amanda Knapp played against each other for the final time on Tuesday night as Poppe’s Gardner-Webb Runnin’ Bulldogs edged Knapp’s UNC-Asheville Bulldogs by a 2-1 margin in a Big South Conference women’s soccer match on the GWU campus in Boiling Springs. 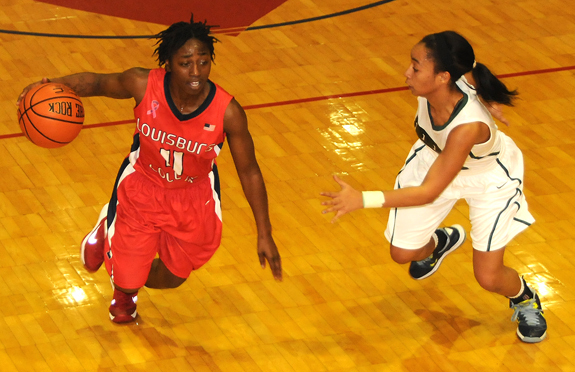 LOUISBURG -- The Louisburg College Women’s Basketball team is heading in a new direction for the 2013-14 season since  Shay Hayes has taken over the reigns as head coach, but the goal remains the same -- a National Championship. With the Lady Canes winning the national title in 2013, they now have a big target on their backs. Each night they will have to defend their title against someone who wants to say that they beat the best team in the country. FRANKLINTON — A three-day delay due to weather did not seem to bother the Bunn High School football squad’s running attack Monday night as the Wildcats toppled hosting Franklinton 38-21 behind the strong running of Tevin Ferrell. Ferrell finished the night with 262 yards rushing (22 attempts) and four touchdowns to pace the Wildcats to a key Northern Carolina Conference triumph. LOUISBURG -- Louisburg High School wrapped up no worse than a share of the Tar-Roanoke Athletic Conference on Monday with a resounding home victory over the Northwest Halifax Vikings. LHS used another big night on offense from Antonio Smith and pitched a shutout on defense to secure the 48-0 decision at Patterson Field on the LHS campus. RALEIGH -- Doug Warf, Vice President of Marketing for the Carolina Hurricanes and Executive Director of the Kids ‘N Community Foundation, has announced today that tickets for the annual Casino Night and Wine Tasting, presented by PNC, are on sale. The event will take place on the floor of PNC Arena on Feb. 1 from 7-11 p.m.
HENDERSON -- The Vance-Granville Community College women’s volleyball team completed its 2013 campaign on Oct. 22 with a double-header on the team’s home court at Aycock Recreation Center in Henderson. The Vanguards hosted the Cougars from Central Carolina Community College. VGCC got off to a promising start in the first match, winning the first set by a 25-21 score, but lost the next two to Central Carolina, both by 25-18, before losing a close fourth set, 25-22. 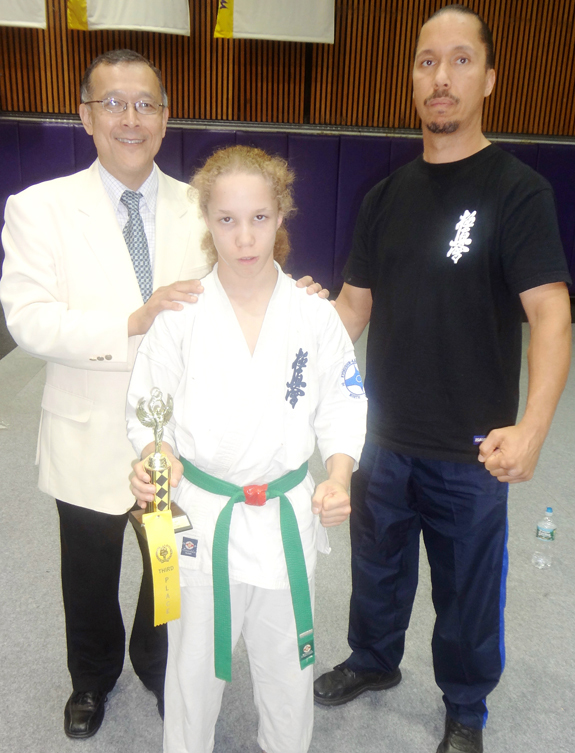 NEW YORK, N.Y. -- Christian Buffaloe, a 13-year-old local youth, recently competed in the “2013 All American Open International Karate Championships” in New York City. This prestigious annual event is sponsored and organized by the International Kyokushin Karate Organization in Tokyo and features fighters from Japan, Russia, Europe, Australia, Canada and South America. 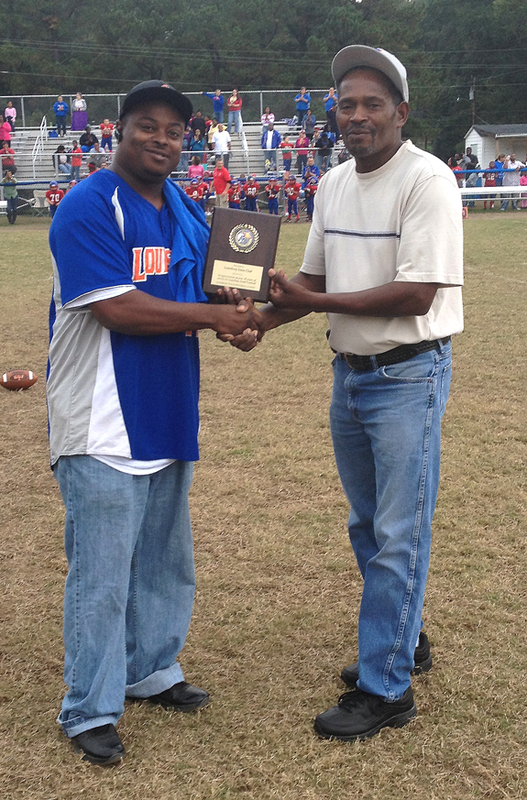 (L to R) Mike Epps, the Current Director of Louisburg Youth Football and Cheerleading League, presents a plaque of appreciation to Mr. Eugene Yarborough, the former Director of the Louisburg Lions. The ceremony was held at a recent game. Yarborough has coached youth sports in Louisburg for many years, but has recently opted to retire. Louisburg College’s Ostin Salmeron (left) avoids contact with USC-Lancaster’s Chris Gonzalez during the Hurricanes’ victory last Tuesday at the Region X Men’s Soccer Tournament. Louisburg High School’s Eliceo Hernandez (right) follows the movement of the ball along with a Voyager Academy player during last Wednesday’s game in the Class 1-A Soccer Playoffs. 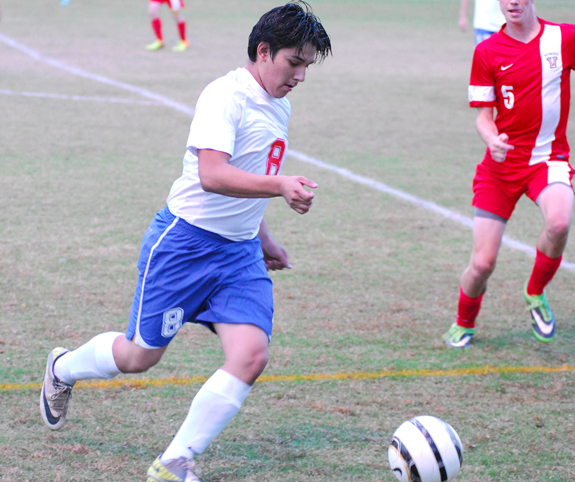 Louisburg High School’s Elecio Hernandez heads upfield off the dribble during last Wednesday evening’s victory over Voyager Academy in the first round of the Class 1-A State Boys Soccer Playoffs. The Warriors hosted the event at Joyner Park. 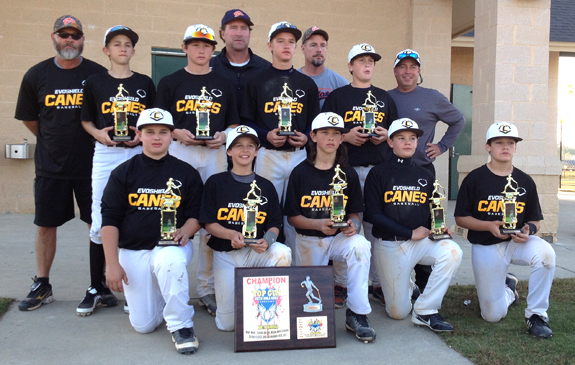 The Carolina Pilots/Evoshield Canes recently won the 2013 Top Gun Winter World Series 13-Under Gold Division Tournament. During the event, the club outscored its opponents by a whopping 56-11 margin. 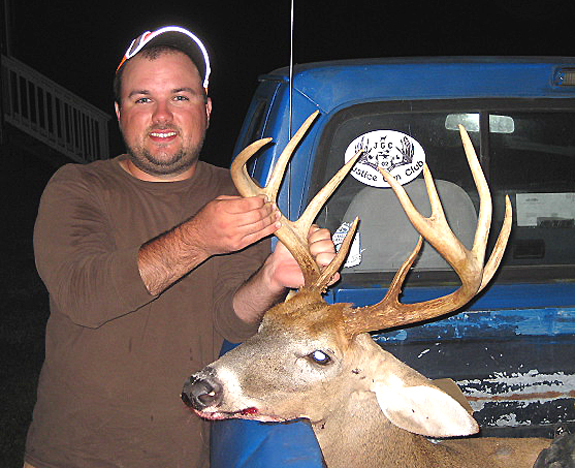 Jay Wright of the Justice Community harvested this 10-pointer during a hunting expedition in Franklin County last month. He used a muzzle loader to bag the impressive deer. Business leaders and legislators envisioned the Raleigh & Gaston Railroad, built between 1836 and 1840, as an important means of revitalizing North Carolina’s moribund economy. The state’s failure to spend money on internal improvements during the early 19th century had stifled business development and hurt farmers who needed economical means of transporting their crops to market. Five time Grammy Award winner B.J. Thomas received well deserved standing ovations on Nov. 2 at Johnston County PAC. By the time he takes the stage Nov. 9 at JPAC in Louisburg, he will have made a quick trip home to Texas and flown back to NC to do a show on Thursday at Brunswick CCC and another in Newberry, S.C., on Friday evening. Ashley S. Gilliam of Norfolk, Va., celebrated his 90th birthday Wednesday, Oct. 30, 2013. A reception was held in his honor on Saturday, Oct. 26, at the East Coast Gospel Lighthouse Church where he has been a faithful servant for 60 years. Surrounded by family and friends, the afternoon was happily spent commemorating this milestone in his life. Is Your Farm Safe? Become a Certified Safe Farm! It’s no secret that agricultural work is tough work and as America’s farm families know, it can be dangerous. Last year, agriculture recorded the highest fatal injury rate of any industry, with the rate of on-the-job fatality in agriculture nearly seven times the rate for all U.S. workers. The NC Agromedicine Institute, AgriSafe of North Carolina and NC Cooperative Extension are collaborating to promote Certified Safe Farms in North Carolina. The $500 scholarship continues the legacy that Senator Speed created as a 32-year member of the North Carolina State Legislature and through his commitment and dedication to agricultural interests. 4-H: Making the Best Better! What better way to celebrate Farm City Week than sharing Franklin County 4-H’ers success throughout 2013. Franklin County 4-H continues to grow with 125 youth involved in community clubs, over 2,000 youth involved in school enrichment, and over 250 youth involved in summer programs. Franklin County is not only raising crops, we are raising knowledgeable and caring youth to become wonderful citizens in our town, county, and state. Dr. Laverne Daniels, principal of Cedar Creek Middle School, has been selected as principal of the year for Franklin County Schools. Daniels has been with the county schools for two years, serving as principal of Cedar Creek Middle since October, 2011. “I am honored to represent the district and my colleagues,” she said. “I couldn’t do it without the hard work of our students, teachers and my administrative team at Cedar Creek,” she said. Ladies Night Out with a purpose! LADIES NIGHT OUT. 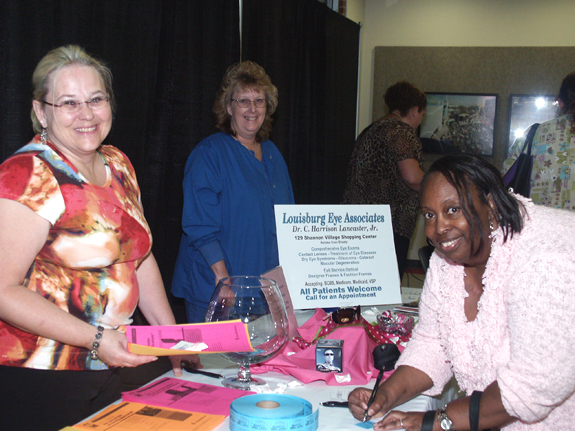 Dawn Lancaster and Lisa Watkins of Louisburg Eye Associates are shown with Rebecca Hicks as she registers for a prize during Novant’s Ladies’ Night Out in Louisburg Oct. 29 at Louisburg College. 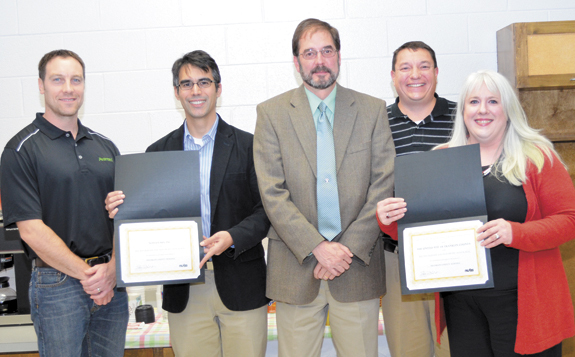 Franklin County Schools recognized Novozymes of North America and the United Way of Franklin County for their support of the schools during Monday night’s board of education meeting. 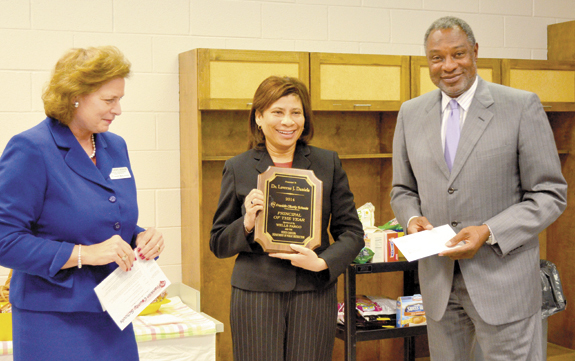 The awards were part of the North Carolina School Board Association’s 2013 Honor Roll program. “From donating grant funding to book bags and school supplies to donating winter coats to needy students, both Novozymes and the United Way have always been strong supporters of Franklin County Schools,” said Gil Johnson, school board chair. A Louisburg man was killed last week following a single-vehicle wreck. According to the State Highway Patrol, Julian-Michael White was driving a 1998 Toyota car south on Breedlove Road just after 6 p.m. on Nov. 1 when he ran off the road. According to the report by Trooper B.E. Pulliam, the car struck a ditch and hit several trees. A Mitchner’s woman died late last week from injuries sustained in a house fire. According to unofficial reports, Grace Smith was attempting to use a kerosene heater at her home on Oct. 8 when the incident occurred. According to her obituary, Smith sustained burns over 30 percent of her body and was airlifted to the burn center at UNC Chapel Hill. Franklinton American Legion Post 52 will hold a Veteran’s Day program on Saturday, Nov. 9, at 11 a.m.. The program will honor all veterans and will especially recognize our Vietnam War veterans, as this is the 50th anniversary of the initiation of that war. All veterans, their families, and the general public are invited. Post 52 will serve a free hot dog and hamburger lunch after the program. TRICKS ALL AROUND. 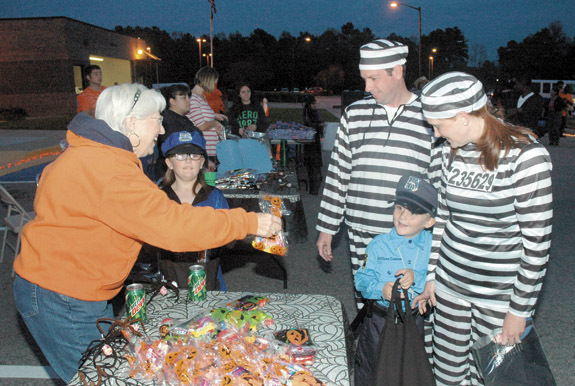 Above, Stephanie Williams, right, and Brian Jacobson are dressed as criminals while Hannah, center left, and Carson portray the cops that rounded them up during Halloween festivities at the Franklin County Sheriff’s Office. OUT FOR TREATS. 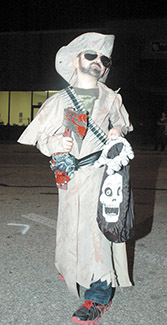 Left, Tyler Williams as a zombie hunter in downtown Franklinton. BANNER DAY. 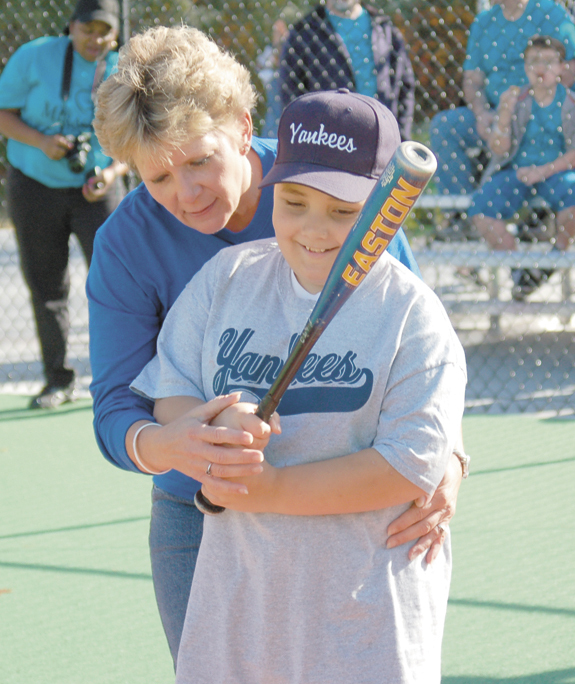 Above, Miracle League Board Secretary Pam Tant helps Trevor Thimme. BANNER DAY. Above, Novozymes’ Kevin Potter, right, presented a $10,000 check with, from left, Laura Perry, Tommy Piper Wendy Carroll, Rodney Medlin, Cheryl Keith, Pam Tant, Donna Wade, Tassie McGannon and Shirley Coltran. BANNER DAY. Right, Coach Jon Johnston with Matthew Johnson and his Buddy, Tiffany Hicks. 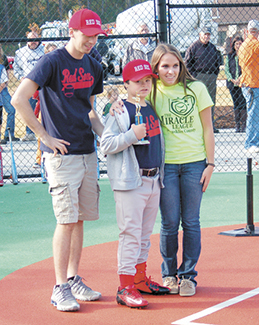 The festivities were part of the Miracle League of Franklin County’s ribbon-cutting ceremony, opening a field of play at Long Mill Elementary School just outside of Youngsivlle. 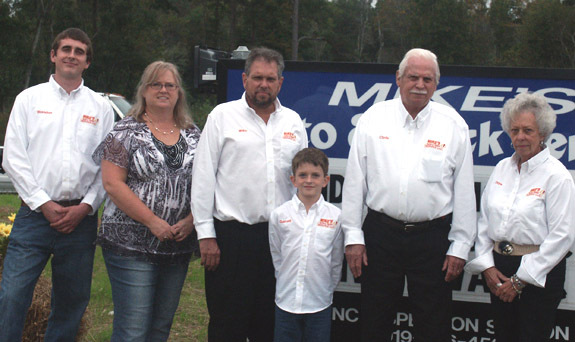 Employees, family and friends of Mike’s Auto & Truck Repair celebrated the company’s grand opening with a pig pickin’ on Oct. 19. From left to right are Brandon Bunn, Karen Davis, Mike Murphy, Garrett Murphy, Clyde Murphy and Faye Murphy. 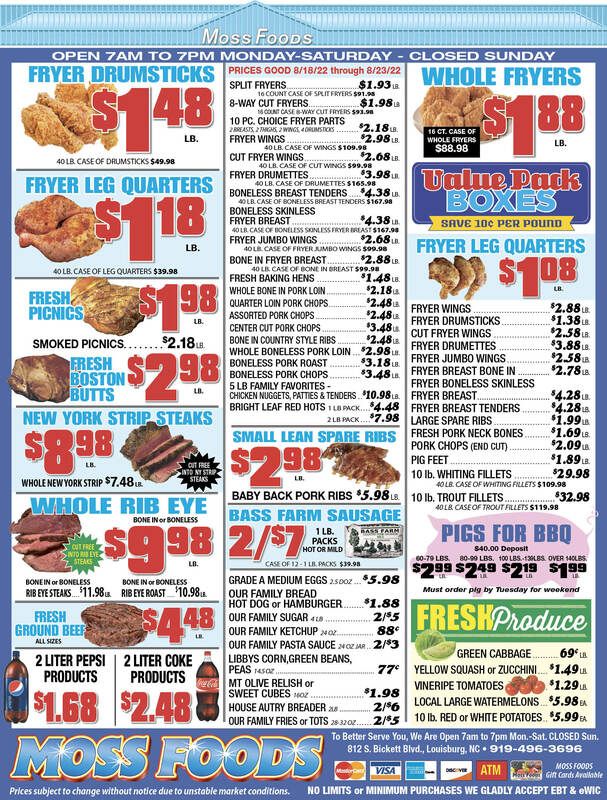 The repair shop is located at 1968 N.C. 58, Castalia.